On Good Friday, after 6 weeks or so of prayer, fasting and contemplation, the Church asks us to enter into the Christ event of the Cross – the historical moment itself and the cosmic ripples and echos of it, with all its ramifications and blessings for us and for all creation. But Holy Cross Day is a bit different. It asks us to look at and to contemplate the symbolic nature of the Cross. So that’s what I am inviting you to do now and perhaps on into the next week. If I offer something from my own contemplations, what I offer is just that and you might well approach it differently. That’s well and good. Our thinking, feeling, contemplating, are ways of travelling towards the truth or God’s heart or the meaning of the Cross. But it will be necessary to let go of them all to actually arrive at such destination. In fact the mystics say that it is at that moment of letting go that we find that we have already arrived. John’s Gospel, for example, is all about that I think. One place I can begin my journey is with a negative image or with a negative but for me historically very powerful use of the image. The American writer Mark Twain said that, “History does not repeat itself, but it does rhyme.” The Christ event of the Cross – the crucifixion, execution, murder of the innocent, God-filled Son of Peace – happened one time. History doesn’t repeat that but much of what I learned in school to be history and much of what I see in the world today certainly rhymes with it. Innocent people in and from Syria, Iraq, so many parts of Africa, South America, the Middle East and elsewhere, bombed out of their homes and forced to flee for their lives, echo and rhyme. The abuse of children, calls for so called voluntary euthanasia, shootings in schools, in the streets, on the beach, in the office, all of these rhyme with the executioners too. But the negative image at the beginning for me this morning is that of a cross held out before the Roman, the French, the Spanish and the British Empire armies who went all over the world in the steps of “explorers” and wiped out indiginous lives and life-styles in the names of progress and freedom. So ironic! It would be laughable if it weren’t actually true. But it is true and the troubles around the world today are rooted right there in those empires’ abuse of this earth and its inhabitants. And it makes me weep that the cross was then used not only to somehow claim sanctity for such appauling treatment but to subsume the religious practices of people so in oneness with Creation and God already, and who were so able to receive Jesus’ teachings and love of God even through the monsterous ways in which the Bible and the Cross were used as instruments of control by their European overlords. So it is with the Native Americans, Australians, Africans and with out Celtic ancestors in mind that I look this morning at the Holy Cross. 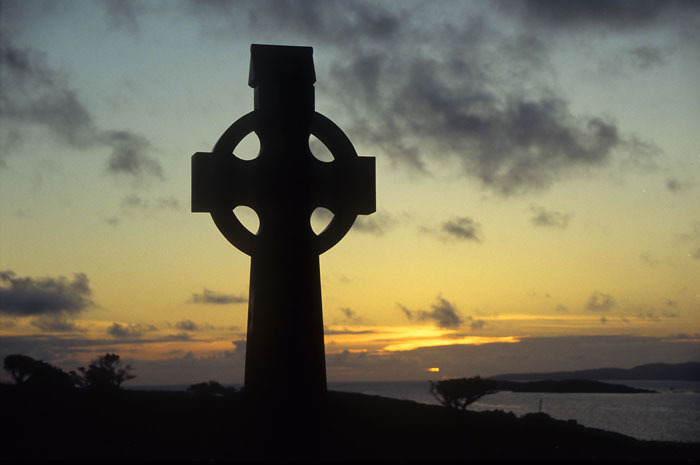 Let’s look at this Celtic cross. First my eyes fall on the centre, where the vertical and the horizontal intersect. The perpendicular. Here is Christ’s heart. God’s heart. The universal centre. The intersection between time (horizontal) and eternity (vertical). God pours love and healing and Holy Spirit into the world right here. Then there’s the foot of the cross, rooted into the earth. The native peoples revere the mother earth. At the foot of Jesus’ cross, there were a few women and his beloved disciple. Among them was his earthly mother. The Cross reaches into the mother earth and rises to the heavens. Earthly life, beautiful, finite, painful, rising through the heart of God, poured out, broken for me, into new life, infinitely more beautiful, unbounded, eternal, free. Free at last! And yet I am even now free. My life is already infite. As this Celtic circle reminds me, all is connected. Time and eternity kiss each other here at God’s heart and all within the extremities of nature and being touch each other. I am connected with my ancestors and with those not yet born. I am connected with whom I have been and whom I will be, with the earth and with heaven, with all directions north, south, east and west. I am connected with the sun’s rising and with its setting, with moon and stars, with the warm winds from the south and the west and the cold air from the north. My feet feel the warmth of the sand and the cool ocean bathes me. Rain refreshes my soul as sea meets sky and returns, pure and clean, upon my face, as I gaze from earth to heaven and know that the God who is there is here. ~ by Fr Tim Ardouin on September 12, 2015.